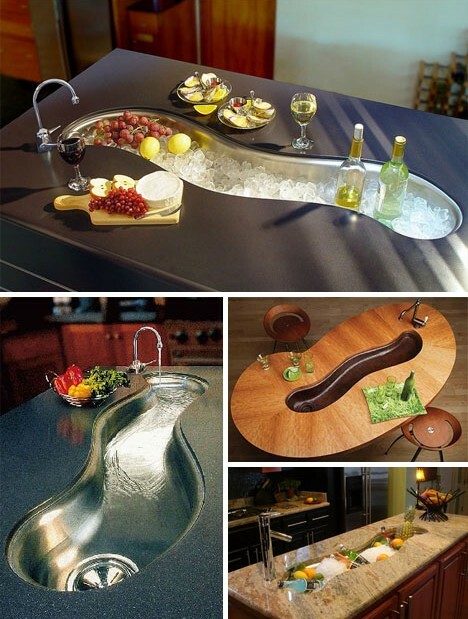 Wash this space… for some of the slickest sinks around! Designers have thrown out everything INCLUDING the kitchen sink in order to reinvent one of society’s most utilitarian fixtures. 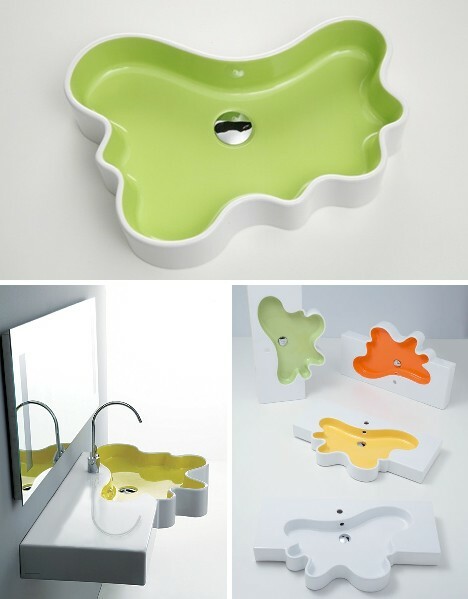 Turning on the creative faucet gives “brain drain” a whole new meaning – as illustrated by these 15 sink-ly spectacular washbasins! 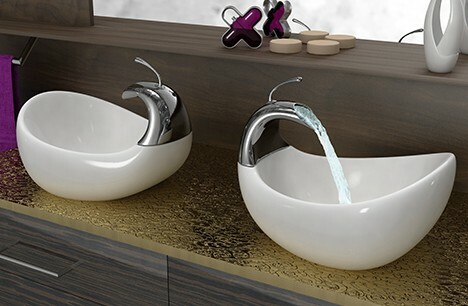 From Germany’s HighTech Design comes the Ammonite Washbasin. 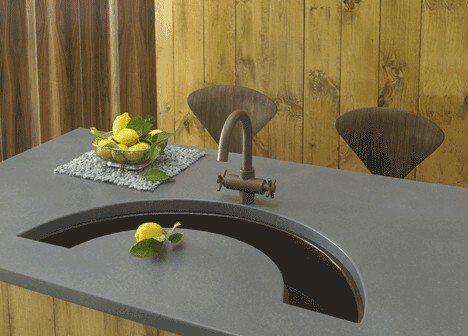 Composed of formed concrete, this sink is no 97 pound weakling… though it DOES weigh 97 pounds. 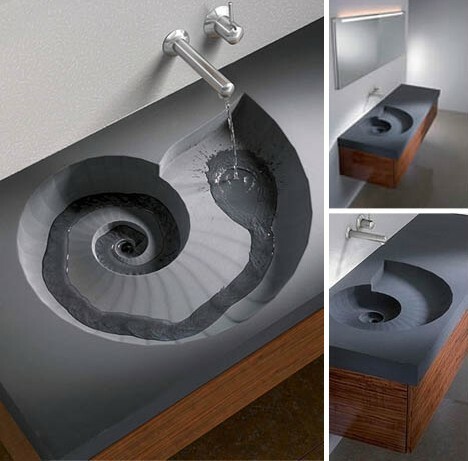 Taking the Ammonite Washbasin for a “spin” must be a unique experience and, if one isn’t careful, a dizzying one at that! The Ammonite Washbasin comes integrated with a concrete slab countertop ranging from 900mm (36 inches) to 1190 mm (47.5 inches) and makes an excellent place to wash up after a meal of brontosaurus ribs. Amirite? 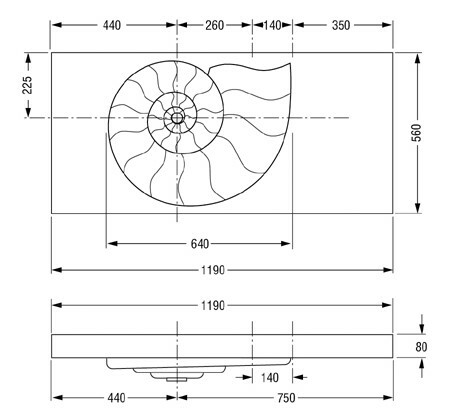 Ammonite! 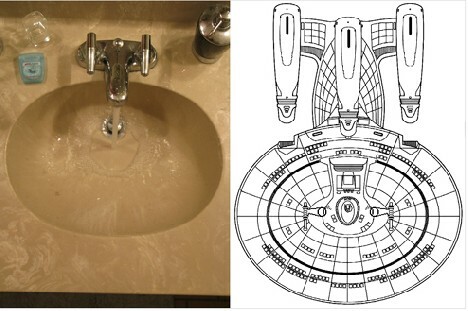 Which came first, the sink or the Starship Enterprise? It’s a chicken & egg conundrum that would even befuddle Scotty – if he wasn’t busy wondering why the warp drive is running hot & cold. 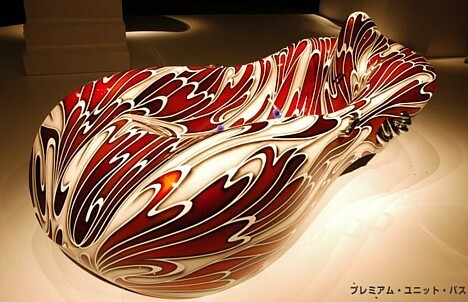 When Tetsuya Nakamura of Nippon Style set out to create the ultimate suite of bathroom fixtures, price was no object. He hopes you’ll feel the same way: his Premium Unit sinks are priced at 1.5 million yen ($13,000) each. Amin answers the chicken/egg question with the Eggy Sink, though many will remain confused. 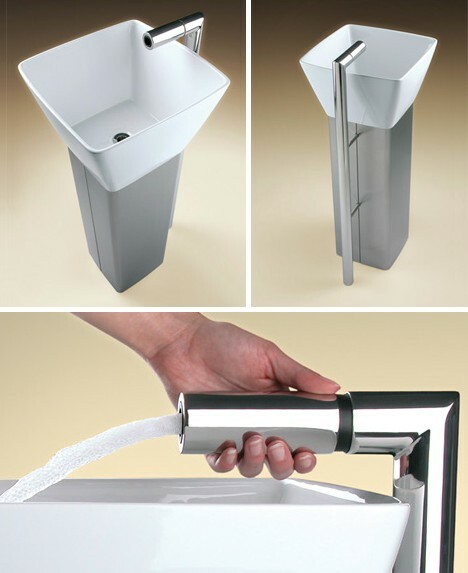 The Eggy Sink, like the Swan Vessel sink, includes unique polished chrome hardware. 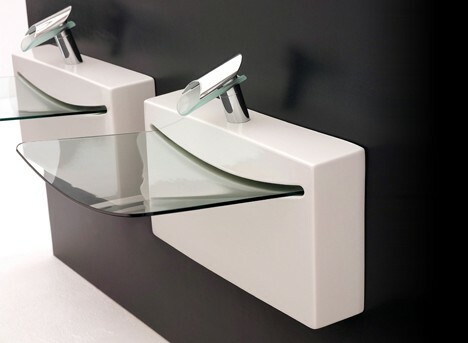 The Art Ceram Bathroom Sink, Wall Mounted combines the light and airy grace of modern Italian design with the spirit of the Space Age. 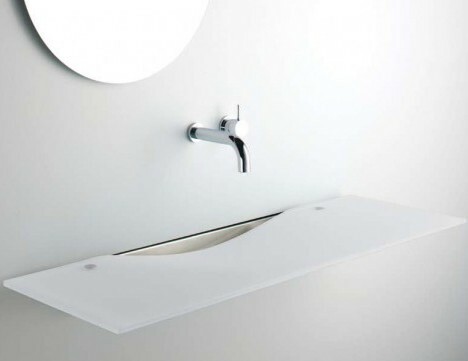 The Urbinati-designed sink features a transparent basin and an invisible drain. 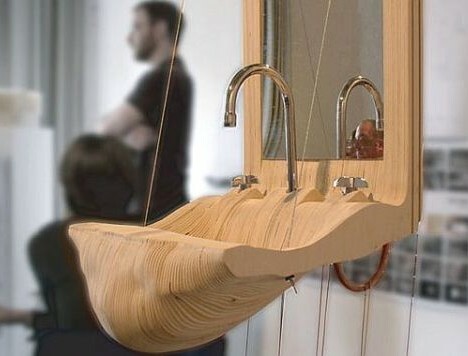 Though eminently practical, it’s hard to imagine washing your socks in this exquisite sink. Disegno Ceramica has introduced a line of sinks and bathroom fixtures that show off a playful form while making no sacrifices when it comes to function. 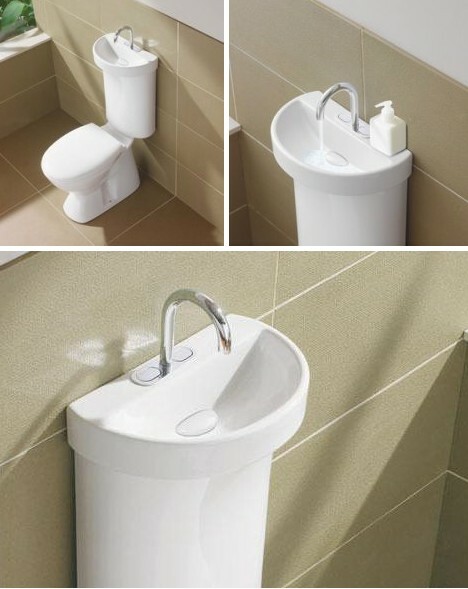 Most attractive is the Splash Collection comprising a shower base, wall hanging wash basin and a pedestal sink. 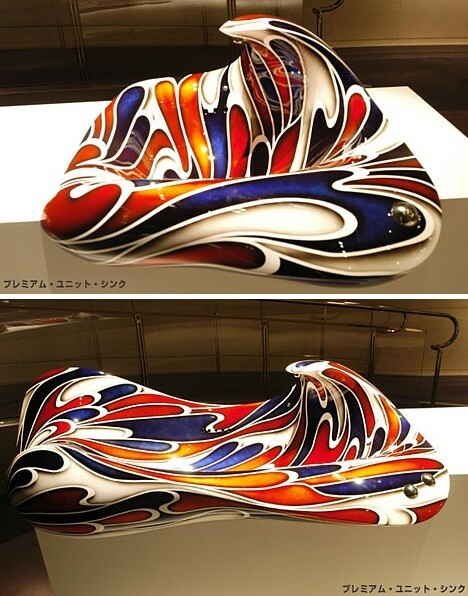 Three colors plus white are available. Disegno Ceramica features other intriguing sink and fixture designs but none have the arresting appeal of the Splash Collection, where you can lighten up while you wash up. The Flo Pedestal Sink & Faucet was designed by Patrick Messier to be a free-standing fixture that looks great from any angle. The brushed stainless steel pedestal and chromed stainless & brass faucet riser give the impression of an early 20th century city tenement complete with fire escapes. 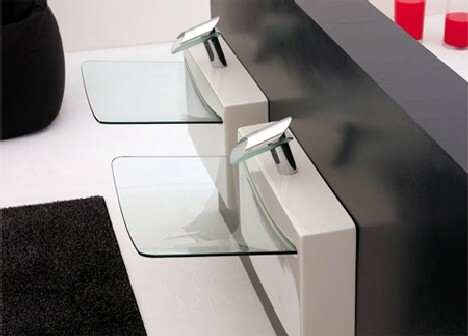 The 19-inch deep sink is made of Perspex acrylic resin. The sink has but one moving part: the insulated faucet that also acts as a control for the water’s flow and temperature. 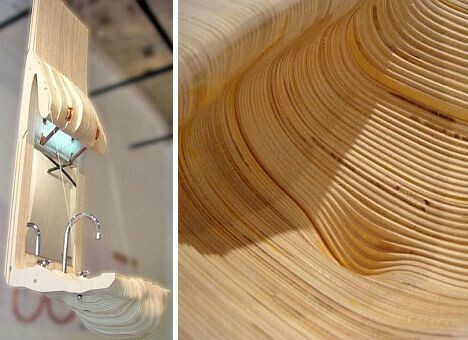 The Fat Sink is made of wood… not the optimal choice of material for a washbasin, one might think, but designer Tolga Baydar has no worries – how long have rainforests been around, after all? Sculpted of fine-grained wood and complemented by polished stainless steel fittings, the Fat Sink is a wo0oden wonder the likes of which haven’t been seen since the Spruce Goose took to the air. Is a portable sink all wet? Not necessarily. 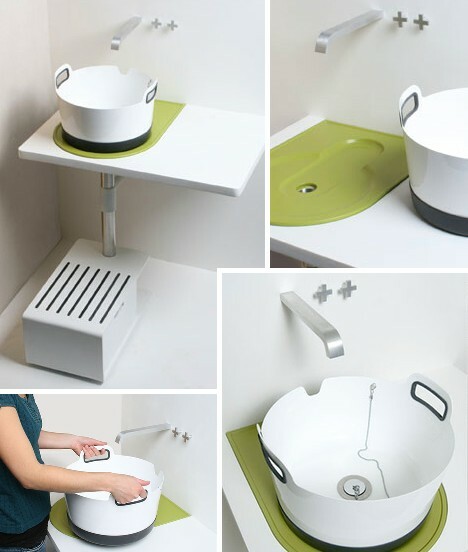 Jessica Nebel has engineered a sink that sits on top of a base… until you need to move it somewhere else. The drain holes match up when in sink mode and close when shifting watery loads to a kitchen island, patio or wherever the cook’s fancy takes them. 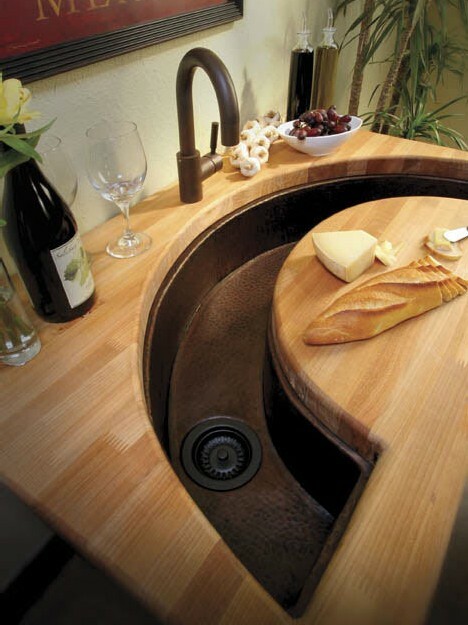 The Elkay Mystic River Sink demands a lot of counter space but that’s just fine – you’ll need a lot of room for the crowd of admirers hoping to see this unusual, hand-crafted sink in action. 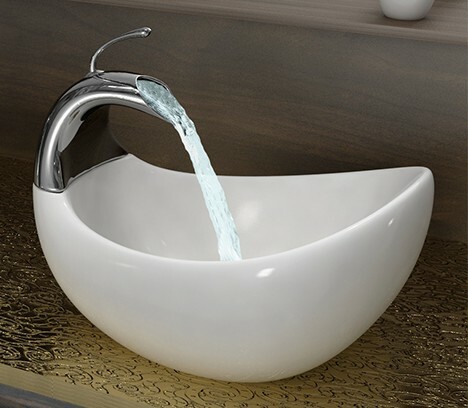 Available in a number of finishes over 16 gauge stainless steel, the Mystic River Sink sports a bowl that slopes “downstream” from faucet to delta, er, drain. The Luna sink from Native Trails is made of 16-gauge, hand-hammered copper finished in natural, antique and tempered finishes. For a brighter look, brushed nickel is also available. The stunning sweep of the 38-inch long basin may look odd, but the broad crescent is actually easier to use when preparing meals as kitchen scraps are swept right in. 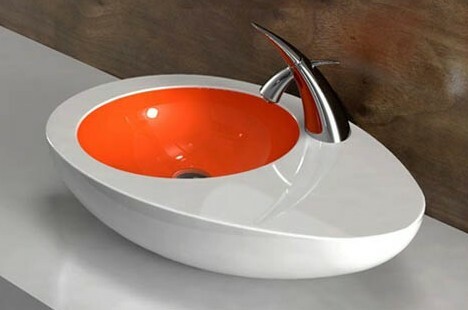 One of the advantages of copper sinks is that it has natural anti-bacterial qualities. Dangerous E Coli germs that can survive for weeks in the microscopic scratches of a brushed stainless steel sink are killed within mere hours in a copper sink. 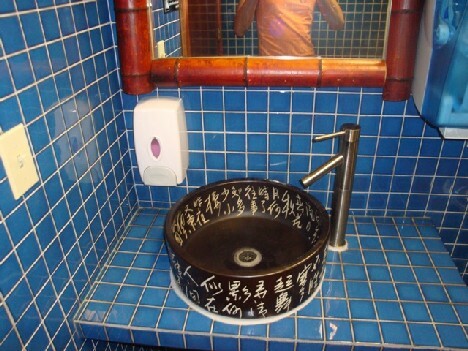 A Sink Above the Stink? The “Profile™ 5 with Integrated Hand Basin by Caroma looks like a weird Japanese toilet, acts like a weird Japanese toilet, yet it hails from (of all places) Australia. The Profile is a green toilet… well, it’s white, but it’s green. After one flushes, the tank is filled from the faucet mounted atop the tank. Scrub up while you can – it’s not a huge tank and you don’t want to be caught short. Would a tolet like the Profile work in the USA? Perhaps… but before worrying about hand-washing how about remembering to flush? Time to take your hand-washing to a higher plane? 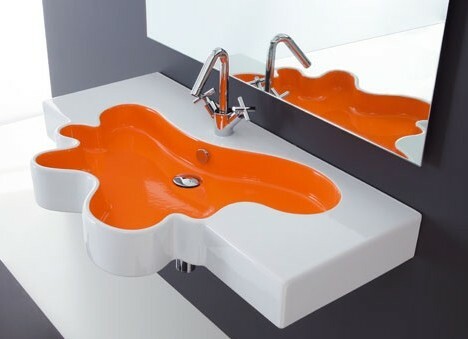 Well all aboard, the Onda Washplane is here to sink all your previous conceptions of what a sink should look like. One of a series of Washplanes from Omvivo, the Onda Washplane looks like a liquid disaster waiting to happen but is in fact precisely engineered to direct water down the drain using only the force of gravity. 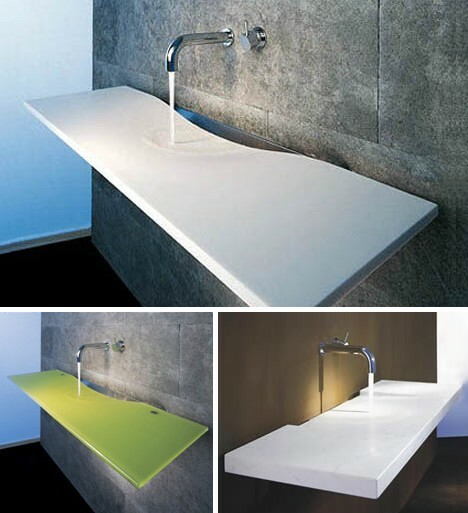 Choose from glass or Corian, single or double. 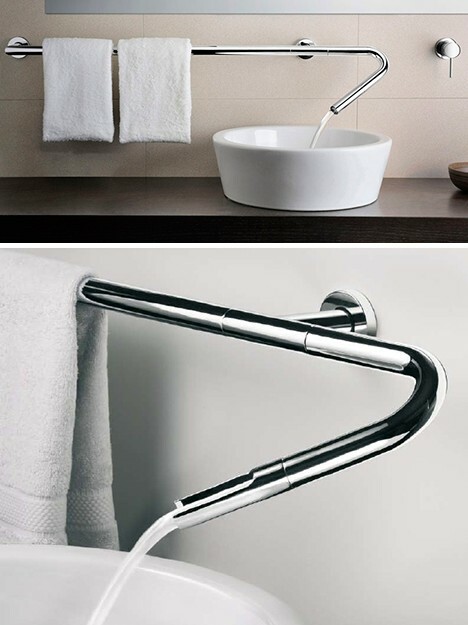 Well OK, bar ONE… the Canali modular faucet that doubles as a towel bar, thus killing two birds with one stone. It’s also the perfect place to wash up after you’ve been out killing birds with stones, since your towels will be nice and warm from running the hot water for a while. Now that you’ve gotten in sink with sinks, take a look around your own home. Satisfied with your kitchen, bathroom and laundry room wash basins? 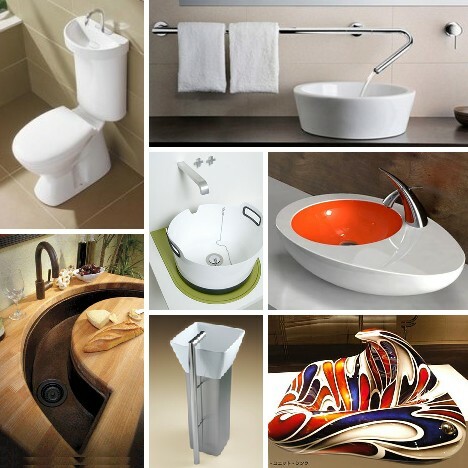 Thought so… but making a change is easier than you think and as one can see, there are some amazing sink designs out there, most of which won’t see your money go down the drain. Nice collection of designs, including wood!